Ever since The Fast and the Furious movie from 2001, drag racing with overly-tuned gazz-guzzlers has become a substantial part of the modern pop culture. Apart from the numerous movie spinoffs, this movie franchise also inspired a number of racing video games, a great number of which on mobile devices. 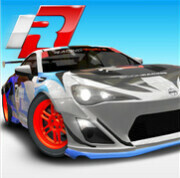 One of the more popular ones, Racing Rivals, initially took gamers for a spin on iOS last summer, but Android gamers were unfortunately left out of the equation up until recently, when the drag-centric title finally crossed the finish line and made its much-anticipated way to Google Play. So, what's the fuss about Racing Rivals? Just like CSR Racing, which is among the most popular racing games on Android, Racing Rivals allows players to race against human opponents. However, what sets this new Android title apart from the competition is that it puts gamers against each other in real time, while CSR Racing makes use of time-shifted multiplayer that is stored in the cloud. Additionally, Racing Rivals allows cross-platform multiplayer. Pair this with beautiful, eye-catching 3D graphics and the game quickly becomes a pretty interesting title for all the gearheads out there. But without further ado, let's go ahead and check out the cars that we get to drive in Racing Rivals. Well, the game allows gearheads to drive the usual suspects at the quarter-mile dragstrip – the Nissan GT-R, the BMW M3, the 2006 Ford GT, and the Mitsubishi Lancer Evo X, to name a few. Representatives of some of the more exotic automotive brands, such as McLaren, RWB, and Pagani are also on board. Although fast by default, you'll need to tune the performance of each vehicle you own in order to remain fairly competitive against the tuned monsters of your rivals. Each race allows players to bet against each other and race for pink slips, too. If you are not familiar with it, the latter option awards the loser's car to the winner in the drag race. The awarded vehicle can be sold later for a hefty sum of money, which can be used to further tune your car or even get a brand new one. You can play Racing Rivals for free, but note that it comes with some in-app purchases. Still, the latter are of the unobtrusive type, so you won't be constantly prompted to upgrade or maintain your vehicle in top form. If you have gas instead of blood running in your veins, then we recommend that you give Racing Rivals a try. This is clearly not a review. It's a preview at best. Even if it was a review, why wouldn't they be allowed to review a buggy game? Buggy games aren't eligible to be reviewed? I guess CSR is better! And nothing beats Real Racing 3 I guess! I somehow like it better than Gran Turismo 5 on PS3. RR3 is quite on par in graphics with GT5! Oh Snapdragon and Adreno, I love you!